Latest reports suggest that Arsenal head of football Raul Sanlleh could be the reasoan why Aaron Ramsey won’t get a new deal. Aaron Ramsey’s future at Arsenal isn’t clear because the gunners at first looked very worried when this season begun yet they were not yet done with negotiations of a contract renewal for the Welshman but the way how things have changed over the last few weeks is very weird. It is reported that Aaron Ramsey was about to sign the new deal on the table but the club surprisingly withdrew it unexpectedly hence leaving the midfielder with no option but to keep playing until his current contract finally expires next year. 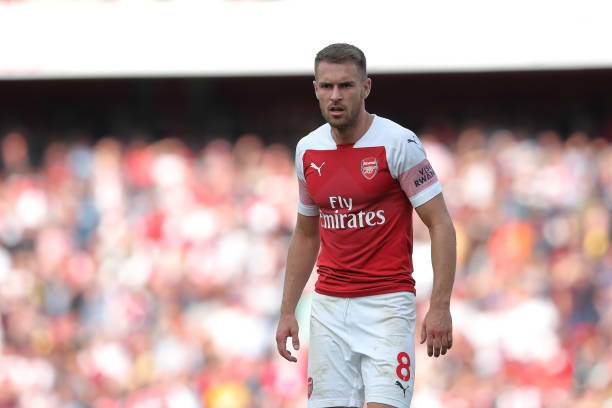 Ramsey’s agent company were the first to confirm the departure of their client via tweets which were later deleted but that doesn’t matter anymore because the player has himself said that he will continue playing his football and that he has left everything to the club, so they will either offer him a new deal or let him go for free next year. The Mirror has however uncovered new information which could be the root cause of this Aaron Ramsey transfer saga because it claims that Ivan Gazidis and negotiator Huss Fahmy are the ones that held negotiatios with the Arsenal midfielder in the past. It seems like they were ready to agree on a new deal which Aaron Ramsey was to sign and then boom; Ivan Gazidis leaves Arsenal for AC Milan hence putting things on hold as the new gunners’ officials needed some time to settle into their new positions. It is said that the Aaron Ramsey new contract negotiations were handed to Arsenal’s head of football Raul Sanlleh who is believed to have made the decision to withdraw the new deal because he wants to promote academy players at the Emirates Stadium like the way he did with Messi, Xavi and many more others. There could be some other reasons why the gunners made that decision but that above could surely be among because it isn’t a coincidence that talks have broken down after Raul Sanlleh got involved.